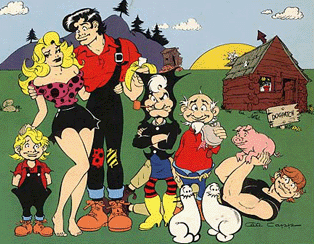 In 1934, cartoonist AL Capp created the now classic satirical comic strip known as Li’l Abner. 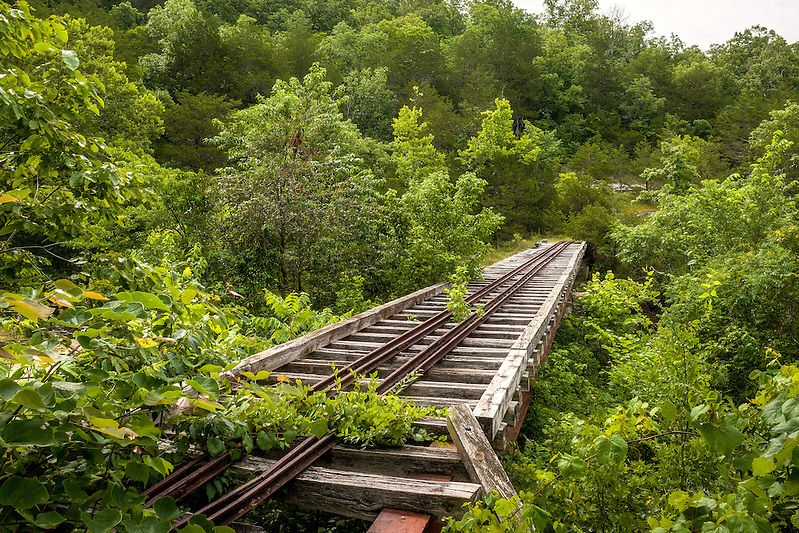 Running until 1977, it featured a clan of hillbillies in the mountain town of Dogpatch, Kentucky. 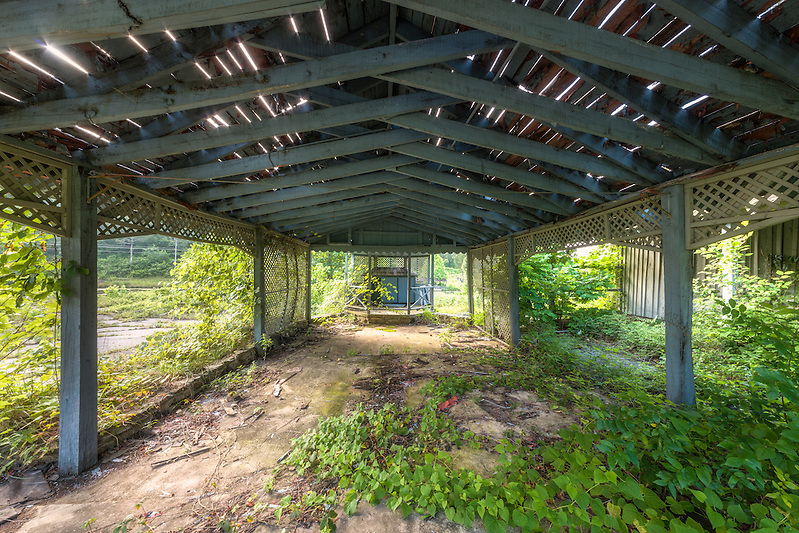 Li’l Abner had a profound influence on how the world viewed the American South. At its peak, the comic strip reached more than 60 million readers in over 900 America newspapers. On the surface, the stereotypical hillbilly humor was just a cover for Al Capp’s take on events, trends, and politics of his time. His stories of Li’l Abner, Daisy Mae, Pappy and Mammy Yokum, the Shmoo, and many others, not only entertained millions, but also influenced pop culture; Sadie Hawkins was “the homeliest gal in the hills”. Her father being upset that none of the men would pursue her, declared that there would be a foot race where all the unmarried gals of the town would chase after the bachelors with matrimony being the reward for capture. 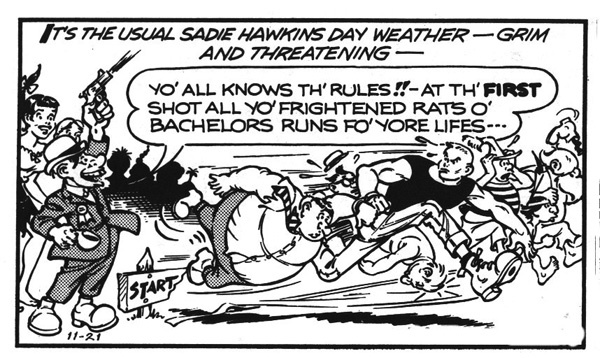 On November 15th 1937, Al Capp introduced the world to The Annual Sadie Hawkins Day Race and sparked a craze across the US. By the end of the 1930’s over 200 colleges were holding Sadie Hawkins Day events. It quickly became an empowering rite at high schools and colleges even before the modern feminist movements. Li’l Abner branched out over the years into books, plays, movies, TV shows, and even a theme park based on the fictitious town of Dogpatch. 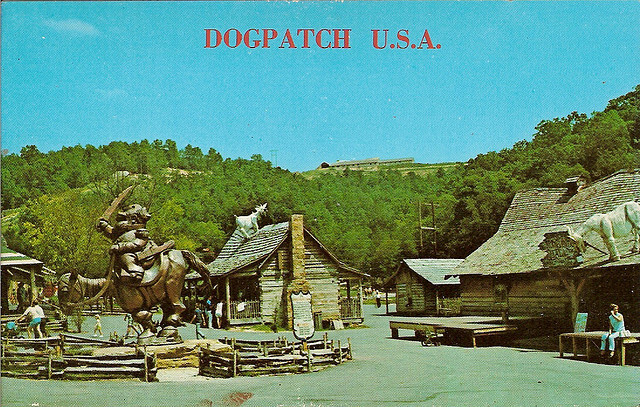 Nestled between Jasper and Harrison Arkansas deep in the Ozarks, Dogpatch USA opened in 1968. 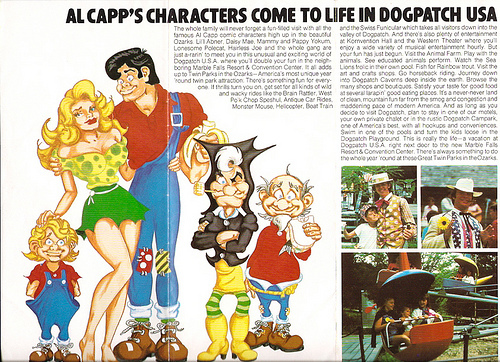 Al Capp who had turned down numerous offers in the past, signed off on the theme park under the assurance that it would be a quiet a dignified place and would not include roller coasters or other thrill rides that would conflict with the rustic theme. Despite the failure of many other theme parks trying to cash in on the success of Disneyland, Dogpatch opened with high hopes. A consulting firm from Los Angeles projected over 400,000 patrons in year one, and a tripling of that number in subsequent years. That projection however proved to be extremely optimistic. 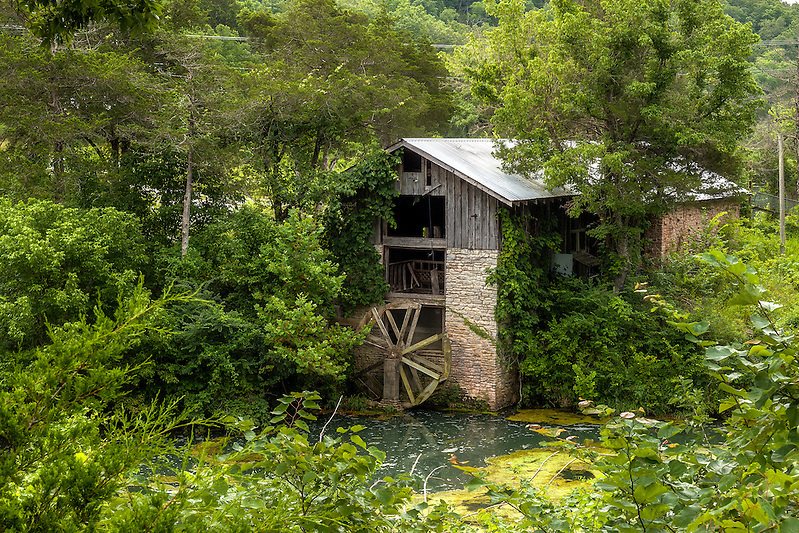 Dogpatch only had 300,000 visitors the first year and never reported more than 200,000 in any subsequent years. 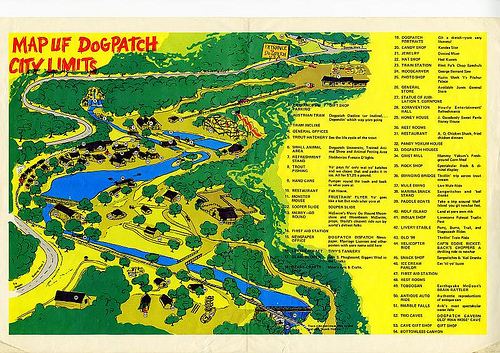 Nevertheless , Dogpatch brought much joy to the hearts of many during its operations from 1968 to 1993. Visitors stayed in a hotel atop a mountain overlooking the site . A funicular would ferry visitors down the mountain where a railroad tram would take them around to various sections of the park. 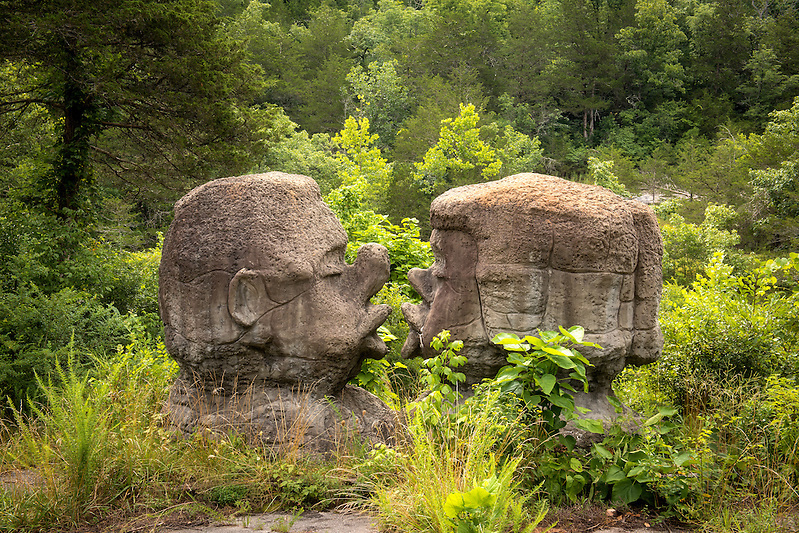 While walking through a village of log cabins, visitors could meet their favorite Dogpatch characters, enjoy many different Li’l Abner themed rides, and discover places like “Dogpatch Cave” and the “Bottomless Canyon”. 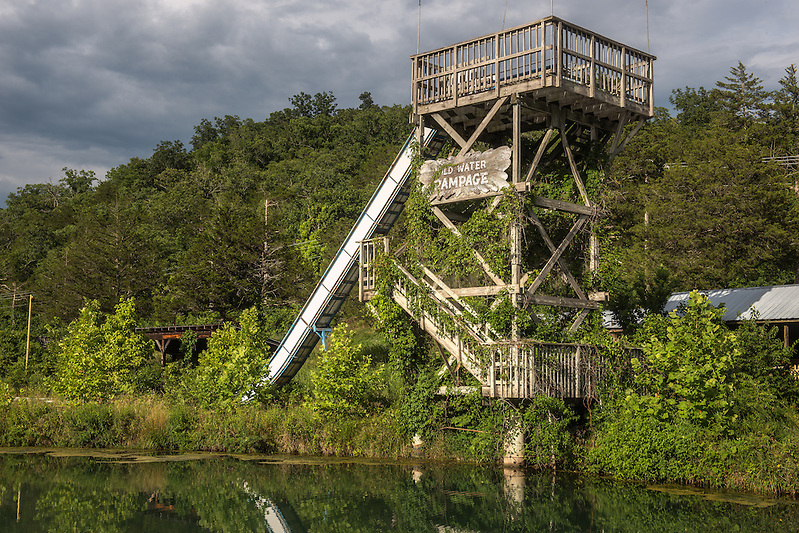 Guests could enjoy trout fishing, a botanical garden, an apiary, paddle boats, and modest midway rides. 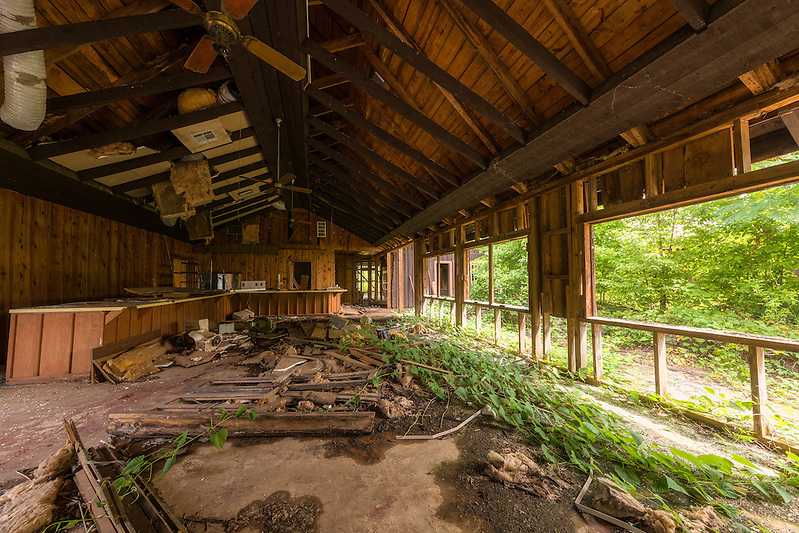 The log cabins which littered the grounds were original 19th century Ozark Mountain log cabins. Each log had been numbered, the buildings photographed, then disassembled, transported, and rebuilt in Dogpatch. 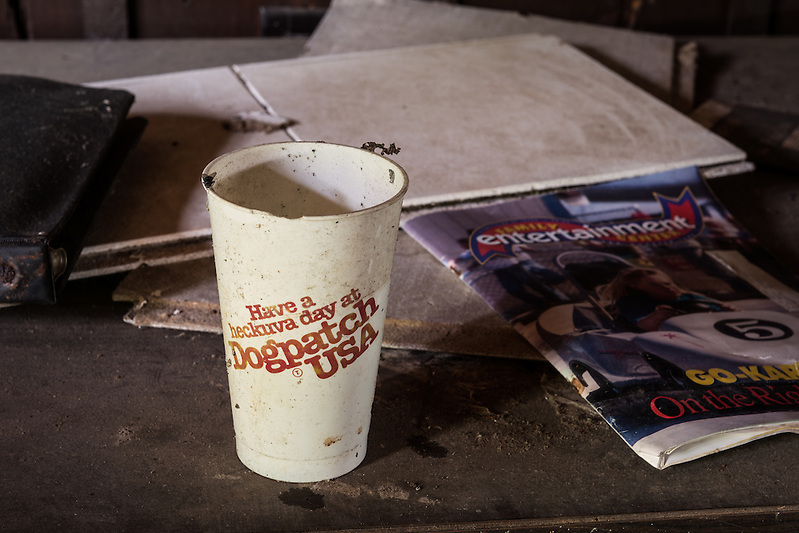 I visited Dogpatch, USA in the summer of 2014 accompanied by my brother Will Arnold. We actually stayed in the very same overlook hotel where guests of the park would have stayed. The Hub, now something of a biker hangout, was a quaint and friendly place, perfect for our photographic operations during our two day stint at the theme park. 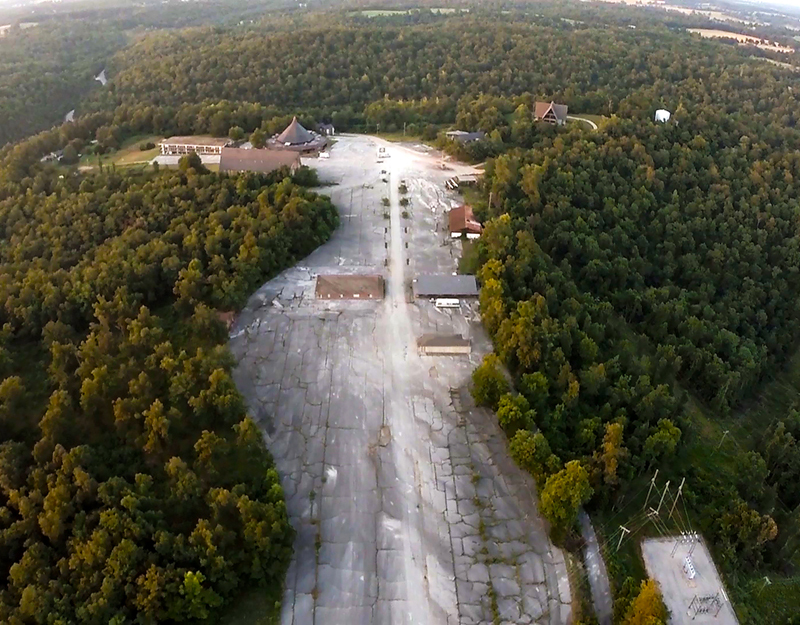 Near The Hub, sprawling field of broken cement is all that remains of the main parking lot and funicular transport building. With permission from the current owner, we parked outside the park gate and made our way inside. 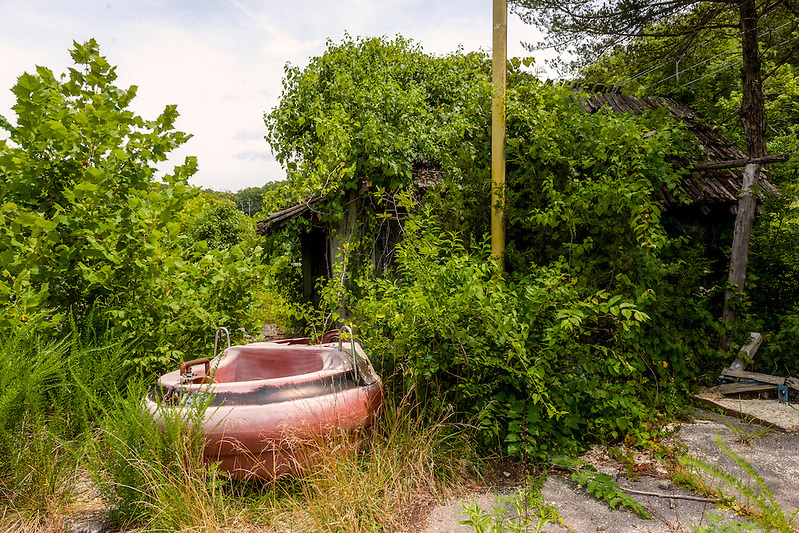 This place was a prime example of nature’s reclamation. 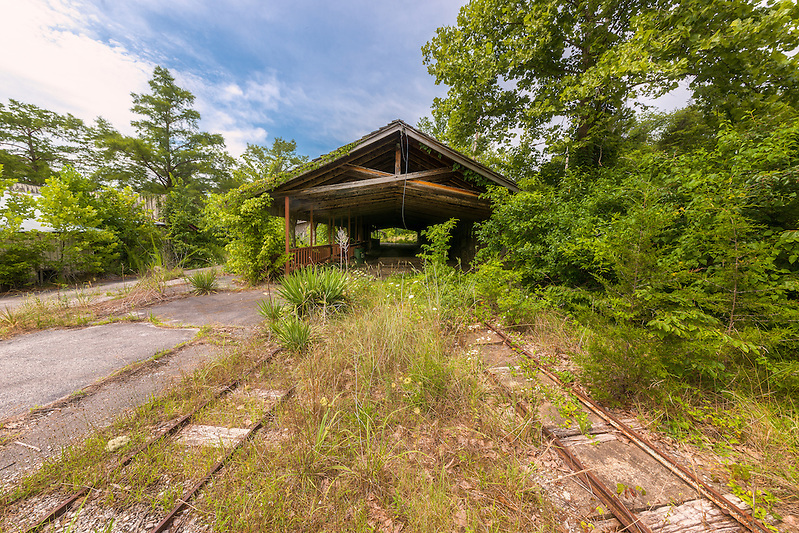 Vines, grass, and trees provided a lush, dense, backdrop to the decaying cabins and vestiges of the park. The hotel owner had warned us of ticks and poison ivy (to which I am highly allergic) and boy was she right! 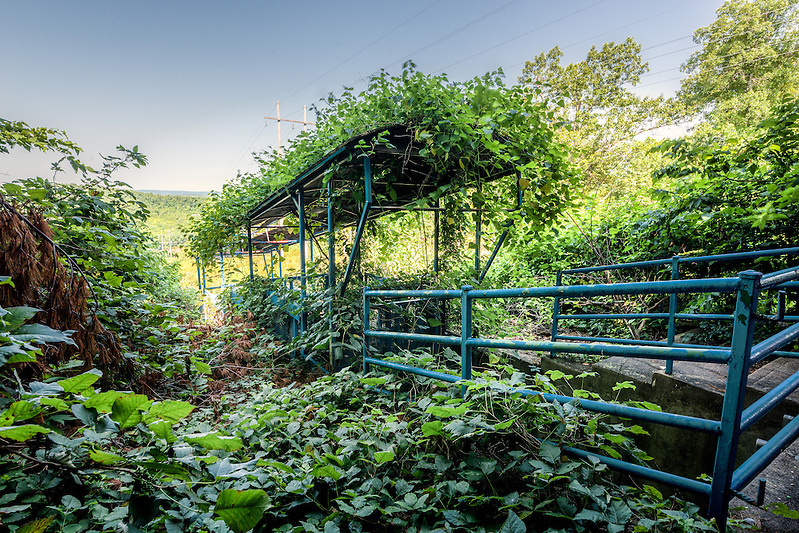 Everywhere we looked poison ivy grew uninhibited. We tucked long pants into socks and tentatively made our way into the Dogpatch jungle. 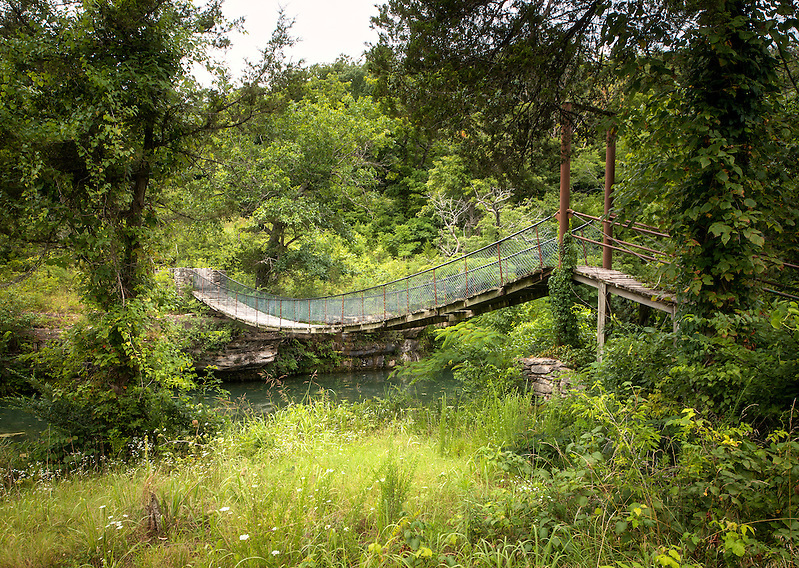 We followed the weedy vestiges of a path along the lake, passing a terrifyingly unstable looking Indiana Jones style rope bridge, until we came to a small clearing with several log cabins and an overgrown church. We heard voices and looked around for the source. Three middle aged women emerged from a trail leading up from a nearby waterfall. We chatted for a few minutes and discovered that they were exploring and reminiscing as they had once visited here many years ago. We explored a bit more then headed backtracked along the lake, into the central portion of Dogpatch. 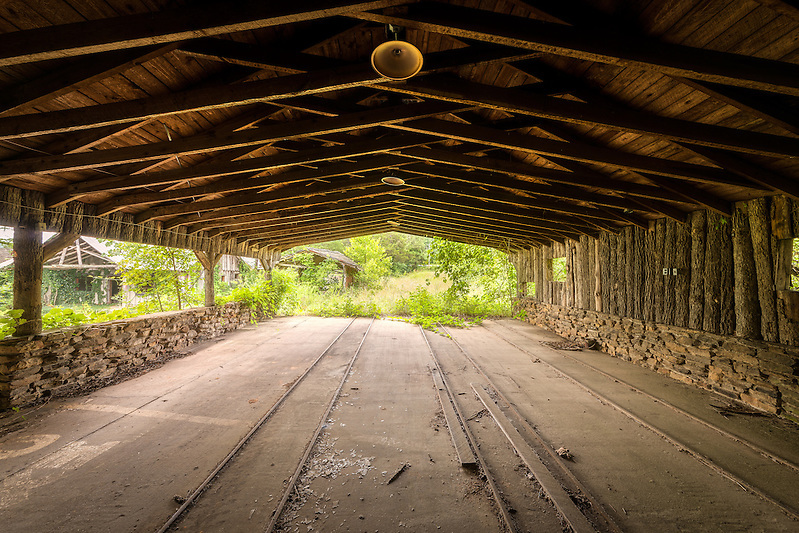 We found the old train station where the trams came and went. 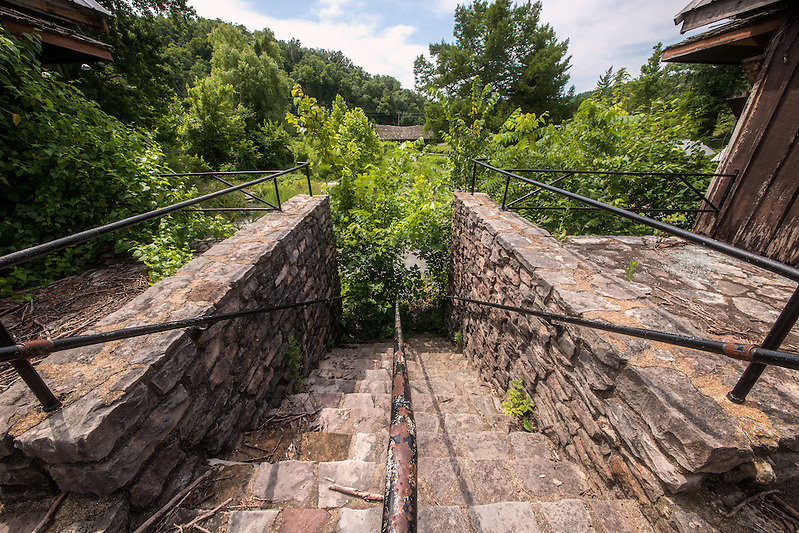 This old funicular located on the top of the mountain next to the park would take people up and down the hill. 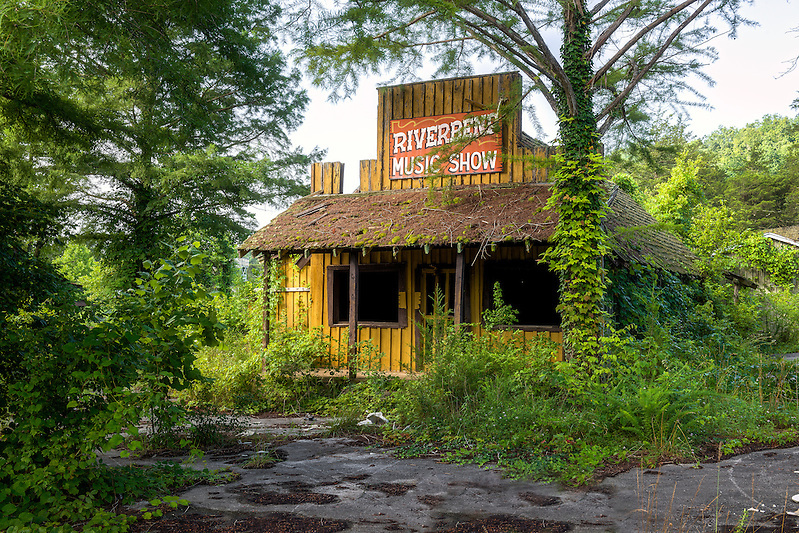 Nearby we found the Riverbend Music Show building which sported one of the only remaining pieces of signage in the park. For hours we examined the various buildings around the center of the park. 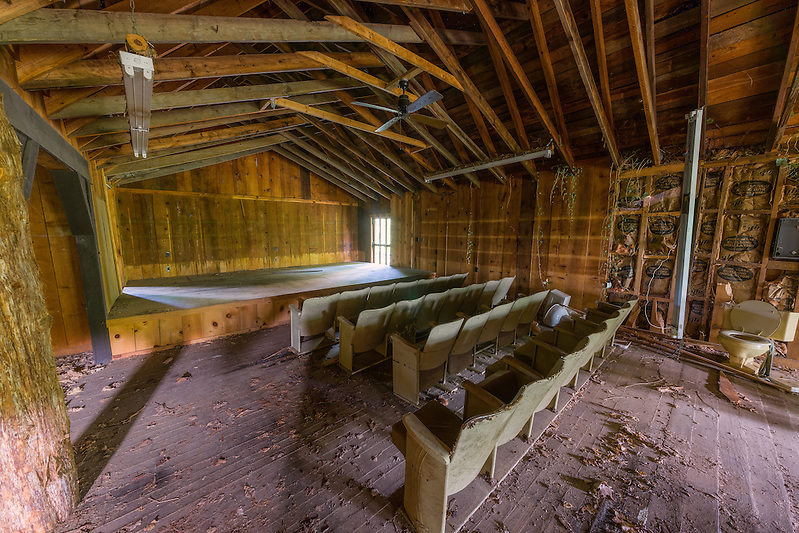 Everything from concession stands, to park offices,most of which were completely gutted and empty. 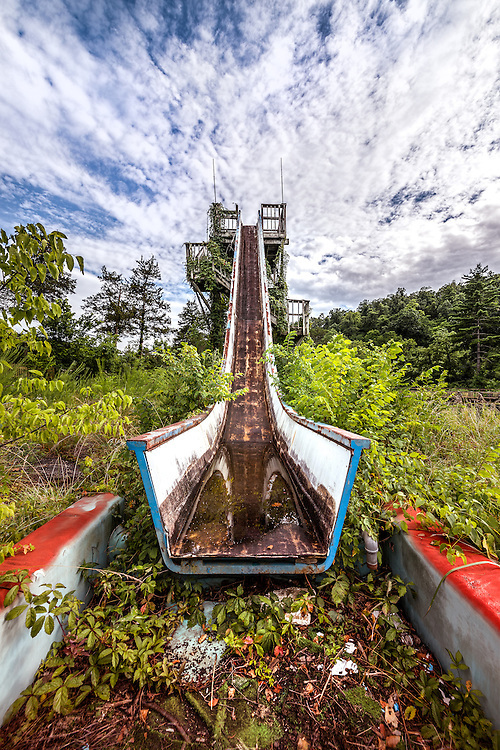 We eventually made our way around the entire lake and found the path leading us to the towering “Wild Water Rampage”, the only ride remaining in the park. Just as we reached it, we noticed a storm on the horizon and given all the gear we were carrying (including a Phantom 2 Drone) we opted to head for the hotel and grab lunch. While sitting on the stoop outside our room watching the storm cross the valley below, I was crossing my fingers for some epic post-storm clouds. All morning the sky had been a flat and featureless gray. As it turns out, I got my wish! As the last few rain drops were tapering off, we raced back down to the park and b-lined for the water-slide. The fresh rain resting the crevasses of the slide and the bright blue sky with puffy clouds made for a fantastic scene of the slide, and one that I am extremely happy with. This was pretty much ‘the shot’ that I came here for, and now that I had it, I was overjoyed. 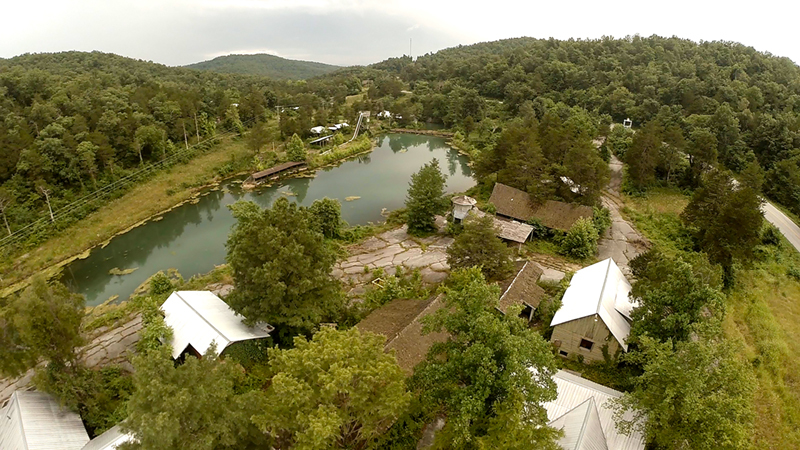 We spent the rest of the time flying the Phantom 2 Drone above the park and getting tons of video footage. This was the first time I was able to use the drone at an abandoned location and Will and I were having fun trying to come up with creative pans and rises. We had a live video feed of the drone’s footage being broadcast to a small LCD mounted on a tripod . That allowed me to focus on framing the scenes while Will was spotter for the drone itself .. We had a couple close calls flying under some of the bridges and narrowly missing unseen tree limbs, but the drone escaped unharmed. 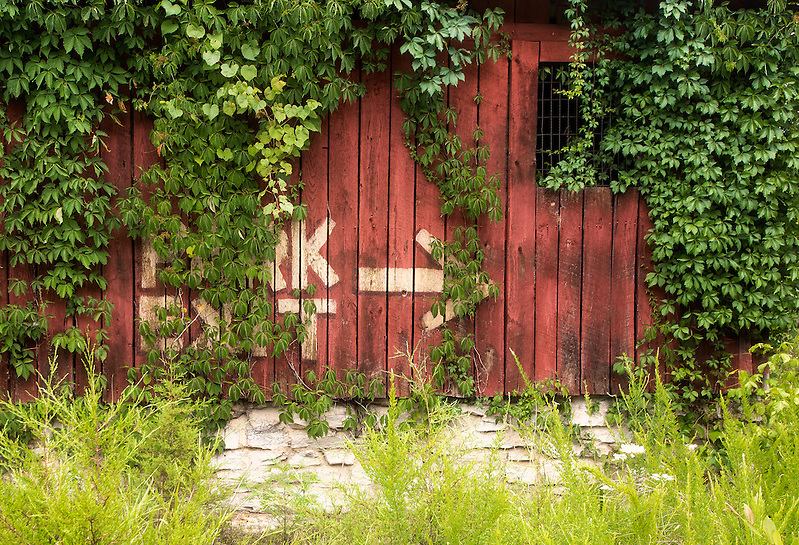 All in all we spent two sweat filled exhausting days exploring and shooting Dogpatch USA. Both of us emerged without a trace of poison ivy or ticks (thank god!) and brought home many fun photos and an extremely memorable experience. 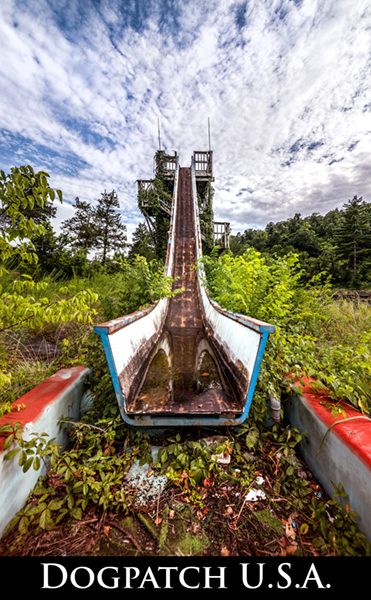 Since our shoot there in August of 2014, the land was sold to a new owner who has begun cleanup work at the park. Over the months Pelsor has led several “river walks” through the now cleaned up site. Interest in the park is high. For his first tour he had over 5,000 people show up! He hopes to have the park re-opened to the public by 2016. It will be interesting to see what happens with Dogpatch over the coming years! very interesting and perfect pictures. memories galore.